Our Lady of Charity of The Good Shepherd Sisters is an International Religious Women’s Congregation in the Roman Catholic Church called to a mission of Compassion and Reconciliation and whose orientation is particularly with women, girls and children who are wounded by life’s circumstances, injustice, oppression, alienation and who live on the edge of the society. Its central governance is in Rome/Italy but was founded in Angers, France in 1835. Its foundation was due to the many women and girls who were left helpless and found themselves in prostitution and children left in the streets after the French Revolution. The same mission is carried out in almost 80 countries around the world. The congregation is also affiliated with the United Nations as an NGO with special consultative status with ECOS. The Good Shepherd mission in Kenya began in 1981 after the request of the Bishop of Meru (Eastern Province of Kenya) who saw the urgent need of sheltering women with children in prostitution who needed a safe refuge to sort out their issues. Since then, the mission has spread to other places (Embu, Kitale and Ngong and Nairobi) in the country due to the prevalence of the marginalization of women and children. The Sisters opened their mission in Nairobi in 1992 at the request of the Our Lady Queen of Peace Parish Council in South B in response to the need of women and girls from the surrounding slums who were neglected and suffered from abuse and oppression and who lacked opportunities for education and/or access to decent employment. 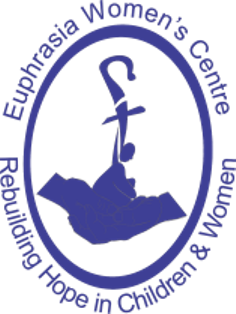 This need urged the Sisters to intervene by opening Euphrasia Women's Centre to give skills training to these girls and women as well as temporary shelter for those who were abused in the community and needed time to recover and plan for their future. In 2004 the Sisters also created an income generating department to help those who have acquired skills to earn a sustainable income. In 2011, the center moved from South B/Nairobi to Ngong. There, a training program and an income generating program are offered.